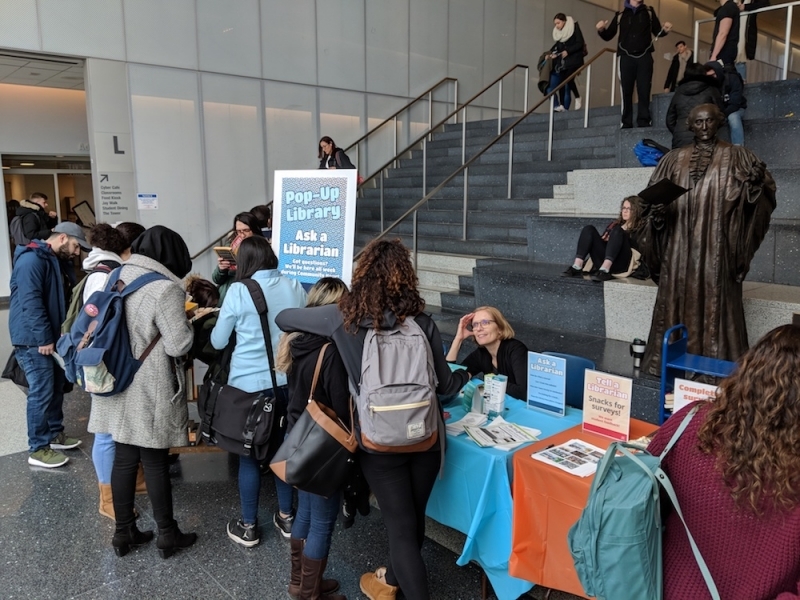 The Lloyd Sealy Library set up shop as a Pop-Up Library in a temporary satellite location: the Kroll Atrium, one of the busiest spots on campus during Community Hour. 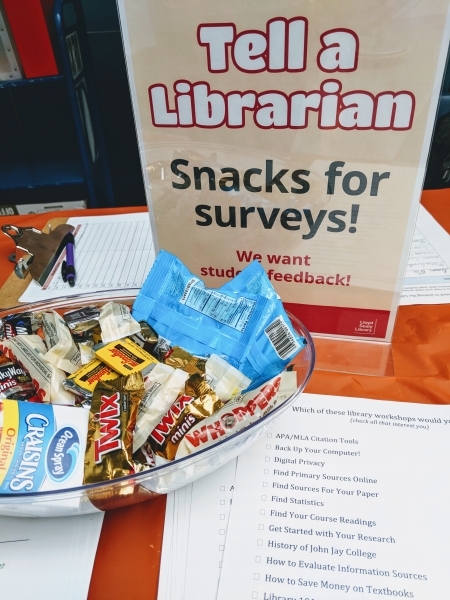 For one week in March, librarians met with passing students at two tables, drawing them in with the offer of free books and snacks and talking with them about how they view the library. Where’s the quietest space on campus? How do you cite an article with 5,154 authors? Does a presidential tweet count as a “credible source”? Every three years, we run an “In-Library Use Survey,” which has been led for many years by Bonnie Nelson (now happily retired). These surveys tell us a lot about how students use the Library and what they expect of it. (See this newsletter’s Spring 2017 issue for the latest results.) But the population sampled only includes students already inside the physical library. What about those who only use the Library online? What about those who don’t know about the library resources available to them? To attempt (informally) to ask a representative slice of the John Jay student population such questions, we set up a “Tell a Librarian!” table, which was covered in various surveys that librarians collaboratively created, from “How would you describe your ideal library building?” (top terms: calming, comfy couches, fast wifi) to “Have you ever used a library ebook?” (21 of 32 had) to “How much did you spend on textbooks this semester?” (see pp. 8-9 for textbook & OER survey results). Students had a lot to say! All survey completions were rewarded with candy and fruit snacks. Students appreciate the library’s quiet atmosphere and wish there were more solo study spots. Visually, students prefer a library that is full of books and seating over one that is full of computers or lab tables. Students feel more confident about finding articles and using databases than finding textbooks or books on a library shelf. used an ebook from the library at least once. had a library instruction session at least once. never watched a streaming video through the library. never checked out a library book to take home. Students have high expectations for the level of service they receive at the library, whether it’s at the Reference, Circulation or Reserve Desks. 44% of 119 students surveyed spent more than $200 on textbooks this semester. The Pop-Up Library was made possible by Faculty-Student Engagement funding through the Division of Student Affairs.